The University of Evansville Wind Ensemble, under the direction of Kenneth Steinsultz, will present its spring concert on Tuesday, April 16, at 7:30 p.m. The performance will be held downtown at the Old National Events Plaza. he program features an exciting mix of pieces by Clifton Williams, Joaquin Turina, Eric Whitacre, Normal Dello Joio, and David Holsinger. The performance is free and open to the public. For more information, call 812-488-2754. The University of Evansville's Department of Music was honored to be asked by EVSC Fine Arts leaders to host professional development workshops for their teachers. On March 6 and again on April 10, middle school and high school music teachers from EVSC worked with UE choral students and received coaching on conducting and rehearsal technique from UE director of choral activities and professor of music Dennis Malfatti. UE choral students served as the laboratory choir for each of the EVSC teachers. Each teacher conducted the laboratory choir followed by coaching from Malfatti with input and constructive comments from our students. These two events were excellent outreach opportunities for the university and gave EVSC teachers a window into instruction at UE. The University of Evansville's Patricia H. Snyder Concert and Lecture Series will present world renowned pianist André Watts in concert on Tuesday, April 30, at 7:30 p.m., at the Victory Theatre in downtown Evansville. Watts will also be conducting a masterclass on Monday, April 29, from 1:00-4:00 p.m. in Wheeler Concert Hall on UE's campus. Both events are free and open to the public. Register for the event on the UE website. Watts was only 16 when Leonard Bernstein chose him to make his debut with the New York Philharmonic in one of the orchestra's Young People's Concerts. It was broadcast nationwide. Two weeks later, Bernstein asked Watts to substitute for the ailing Glenn Gould in performances of Liszt's E-flat Concerto with the New York Philharmonic. More than half a century later, Watts remains one of America's most distinguished and celebrated performing artists. Watts is a regular guest at major summer music festivals, and has appeared with the Philadelphia Orchestra, the New York and Los Angeles Philharmonics, and the St. Louis, Atlanta, Cincinnati, Dallas, Indianapolis, and Nashville symphonies, among others. International engagements have included concerto and recital appearances in Japan, Hong Kong, Germany, and Spain. Watts has appeared on programs produced by PBS, the BBC and the Arts and Entertainment Network. His 1976 New York recital for Live from Lincoln Center was the first full length recital broadcast in the history of television. His performance at the 38th Casals Festival in Puerto Rico was nominated for an Emmy Award in the category of Outstanding Individual Achievement in Cultural Programming. Watts's extensive discography includes recordings of works by Gershwin, Chopin, Liszt and Tchaikovsky; recital CD's of works by Beethoven, Schubert, Liszt and Chopin; and recordings featuring the concertos of Liszt, MacDowell, Tchaikovsky, and Saint-Saens. He is included in the Great Pianists of the 20th Century series for Philips. In 2016, SONY Classical released André Watts - The Complete Columbia Album Collection. Watts received a 2011 National Medal of Arts, given by the President of the United States to individuals who are deserving of special recognition for their outstanding contributions to the excellence, growth, support and availability of the arts in the United States. In June 2006, he was inducted into the Hollywood Bowl of Fame to celebrate the 50th anniversary of his debut. He is the recipient of the 1988 Avery Fisher Prize. At age 26, Watts was the youngest person ever to receive an Honorary Doctorate from Yale University and has since received numerous honors from highly respected schools including the University of Pennsylvania, Brandeis University, The Juilliard School of Music and his alma mater, the Peabody Conservatory of Johns Hopkins University. Watts was appointed to the Jack I. and Dora B. Hamlin Endowed Chair in Music at the Jacobs School of Music at Indiana University in 2004 and in 2017 was named a Distinguished Professor, the highest academic rank the university bestows upon its faculty. University of Evansville professor of piano Garnet Ungar will present a recital on Tuesday, March 26, at 7:30 p.m. in Wheeler Concert Hall on UE's campus. This is free and open to the public. The recital will feature sonatas by Scarlatti and several short pieces by Mendelssohn. For complete program information, visit the music department concert calendar at: www.evansville.edu/majors/music/eventDetails.cfm?eventId=14792. On March 29 and March 30, at 7:30 p.m., the University of Evansville Schmidt Opera Series comes to the Preston Arts Center in Henderson, Kentucky, with Mozart's comedy Così fan tutte: A School for Lovers. All are welcome to attend. Admission is a suggested donation of $10. The Henderson Arts Center is located at 2660 South Green Street, in Henderson, Kentucky. In this production we find our characters in a college town in southern Indiana with visiting guests from a rival Kentucky school. As we wonder who will ultimately prevail in this battle of the sexes, the musical genius of Mozart pervades the arias, ensembles, and choruses of Cosi fan tutte. Mozart's opera is brought to life by UE students directed by Alanna Keenan, Associate Professor of Music with a professional orchestra under the baton of Dennis Malfatti, professor of music. Henderson native Adam Smith, takes on the role of the scheming Don Alfonso. He efforts are aided by his confidant, Despina, played by Madeline Cox of Gibson County. Rounding out the cast are the four lovers Darwi Sandleben, Kathryn Lee, Isaac Cooper, and Clay Steenbergen, all of Evansville, Indiana. On Tuesday, March 19, at 7:30 p.m., University of Evansville music professors Timothy Zifer (trumpet) and Kenneth Steinsultz (euphonium) will give a joint recital. The program will feature works by Mahler, Reger, Rachmaninoff, Jacob, Turrin, Ewazen, and Arutiunian. Anne Fiedler (piano) and the Shepard Brass will be joining them on several pieces. The concert is free and open to the public. For complete program information, visit the music department concert calendar. On March 29 and March 30, at 7:30 p.m., the University of Evansville Schmidt Opera Series comes to the Preston Arts Center in Henderson, Kentucky with Mozart's comedy Così fan tutte: A School for Lovers. In this opera, the cynical Don Alfonso goads his two young friends into making a not-so-friendly wager. Its outcome will either defend the virtue of the women they love or expose an infidelity present in women everywhere. The battle lines have been drawn as the two men set out to test the faithfulness of their unwitting fiancées. Mozart's opera is brought to life by University of Evansville students directed by Alanna Keenan, associate professor of music, with a professional orchestra under the baton of Dennis Malfatti, professor of music. Henderson native, Adam Smith, takes on the role of the scheming Don Alfonso. He efforts are aided by his confidant, Despina, played by Madeline Cox of Gibson County. Rounding out the cast are the four lovers Darwi Sandleben, Kathryn Lee, Isaac Cooper, and Clay Steenbergen all of Evansville, Indiana. UE music students Hannah Hunt and Darwi Sandleben will be featured as soloist, and Kristin Jones will accompany the choirs. For complete program information, visit the music department concert calendar. The University of Evansville’s University Symphony Orchestra and University Wind Ensemble will give a combined concert at the Preston Arts Center in Henderson, Kentucky, on Tuesday, February 26 at 7:30 p.m. The event is free and open to the public. UE assistant professor of music and director of orchestral activities. The University Wind Ensemble is under the direction of Kenneth Steinsultz, UE associate professor of music and director of bands. The Wind Ensemble will open the program with works by Karl King, Clifton Williams, Gustav Holst, and David Gillingham. The orchestra will close program with selections by Marcus Maroney, Gustav Mahler, and Georges Bizet. Adam Smith, the 2018 Vukovich Concerto Competition Winner, will perform with the orchestra in Bizet’s Carmen Suite. The University of Evansville’s William L. Ridgway College of Arts and Sciences Department of Music has announced the upcoming investiture of Timothy Zifer, DMA, as the holder of the University’s Oramay Cluthe Eades Distinguished Professorship in Music. The ceremony is planned for Saturday, March 2, at 1:30 p.m. in Neu Chapel. The Oramay Cluthe Eades Distinguished Professorship in Music was established through a generous gift to UE from the Eades Foundation. Oramay Cluthe Eades and her husband, Alvin Q. Eades, were longtime supporters of the University of Evansville and benefactors of its Department of Music. Cluthe Eades was a graduate of Combs Conservatory in Philadelphia with majors in harp and piano. She was the originator of the Cluthe School of Music in Cluthe Hall in 1924. The Cluthe School became affiliated with Evansville College in 1940. All advanced students matriculated into Evansville College and the young students remained at Cluthe Hall, which later became known as the EC Preparatory School of Music. The Cluthe School was donated to Evansville College by Cluthe Eades in 1942. The prep school moved onto campus in 1962 when Krannert Hall of Art and Music was completed. Cluthe Eades presented a memo to the Evansville College Board of Trustees with the recommendation to create an Evansville School of Music. She offered to serve as director of the school free of charge for three years until the school was self-sufficient. Her reasoning for transitioning her private school into a civic one was that a civic school would be more permanent; it would gain the support of more people and make possible a larger, more complete school; and that by making the school known as a nonprofit educational institution, public-spirited citizens would make bequests to the school. Cluthe Eades wanted the new school to have membership in the National Association of Schools of Music. The present faculty has been selected with that end in view and is acceptable to the National Association. Zifer, a UE professor of music, earned his bachelor’s degree in music education from Ohio University, his master’s degree in trumpet performance from Louisiana State University, and his doctorate in trumpet performance with a minor in wind conducting from Louisiana State University. Zifer teaches courses in applied trumpet, UE Jazz Ensembles, UE Trumpet Ensemble, jazz studies, and music management courses. He received the Dean’s Teaching Award in 2010. Zifer is the principal trumpet of the Evansville Philharmonic Orchestra and is an active soloist and recitalist. He also serves as the principal trumpet and founding member of the Shepard Brass (UE faculty brass quintet). Most recently, Zifer recorded Robert Russell Bennett’s Rose Variations with the UE Wind Ensemble on their CD recording project. Prior to taking over the jazz studies program, Zifer served as director of bands (1996-2008). During this time the University of Evansville wind ensemble toured over 20 states and appeared at the 2001 International Trumpet Guild Conference, competed in the 2002 International Hawaiian Music Festival, and performed at the 2006 and 2008 Indiana Music Educators Association conventions. The UE Jazz Ensemble I has performed and competed at the prestigious Elmhurst College Jazz Festival from 2008 to the present, having received two honorable mentions, outstanding soloist award, and recognition for an original composition by a student. 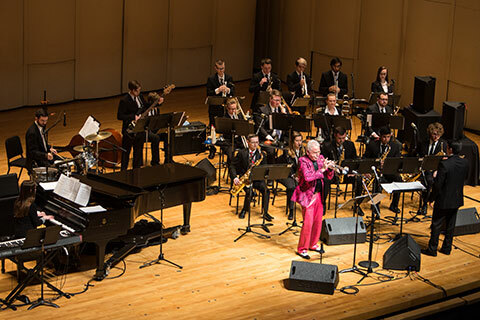 The UE Jazz Ensemble I has hosted numerous internationally acclaimed musicians during the past few years, including trumpeters Doc Severinsen and Allen Vizzutti, vocalists Diane Schuur and The New York Voices, and drummer Max Weinberg. The UE Jazz Ensemble also hosts an annual Jazz Band Invitational bringing in over 13 high school and college jazz bands from across the tri-state area. The UE Trumpet Ensemble has performed at the 2001 and 2004 International Trumpet Guild Conferences, the 2011 University of Kentucky TrumpetFest, and the 2015 Orvieto TrumpetFest in Orvieto Italy. In 2001, Zifer served as the conference host for the International Trumpet Guild Conference on the campus of UE. The conference brought in over 800 attendees from around the world and featured recitals, lectures, exhibits, and clinics by some of the world’s leading trumpet professionals. The University of Evansville’s Department of Music is planning a lecture and recital on diversity and musical performance at 7:30 p.m. on Thursday, February 28, in Wheeler Concert Hall in the Krannert Hall of Art and Music on UE's campus. Douglas Shadle, assistant professor of musicality at Vanderbilt University will present the lecture, titled “Finding a Home on the Concert Stage.” A short recital will follow Shadle’s talk, featuring the works of Florence Price, a black female composer of the early 20th century. On Tuesday, February 12, at 7:30 p.m. in Wheeler Concert Hall on the University of Evansville campus, UE music faculty Emily Britton (horn), Jia-Rong Gan (violin), Alanna Keenan (soprano), and Garnet Ungar (piano) will present a joint faculty recital. Their program will feature works by Schubert, Gounod, Debussy, and Brahms. The recital is free and open to the public. For full program information, visit the music department concert calendar. Pianist Stephanie Trick, internationally-recognized master of traditional jazz piano styles, will be featured in the next Jazz Guest Artist Series concert. Co-sponsored by the University of Evansville Department of Music and the Evansville Jazz Society, the concert will take place in Wheeler Concert Hall on Sunday, February 17, at 4:00 p.m. Trick is widely recognized as today’s most outstanding proponent of the jazz piano styles known as Harlem stride and boogie-woogie. A classically trained pianist, she discovered piano jazz while still in high school. Trick has thoroughly incorporated the swinging piano styles of James P. Johnson, Willie “The Lion” Smith, Fats Waller and Meade Lux Lewis. Trick has performed throughout the USA and Europe, and her exciting performances entertain and engage her audiences with prodigious and amazingly accurate technique. Trick has recorded seven albums and one DVD. Her “Live” CD was awarded the “New Talent Prize of 2011” by the Hot Club of France. Admission to the concert is $15 for adults, $10 for Jazz Society members and $5 for students with I.D. Tickets can be obtained by contacting the UE Department of Music at 812-488-2754, or at the door. For more information, contact Edwin Lacy at 812-488-2227 or EL2@evansville.edu. University of Evansville music management students Peter Blok, Justin Morrison, and Michelle Nuti attended the 2019 Winter NAMM Show in Anaheim, California, on January 24-27 with their faculty advisor, professor of music Timothy Zifer. The students had the opportunity to visit over 1,000 exhibits of music products from around the world, and attend informative music business sessions as well music performances. UEMMA (University of Evansville Music Management Association) raised money for the trip through a fundraiser, applying to SFB, and receiving assistance from FUEM (Friends of UE Music). The Department of Music at the University of Evansville will present its annual Holiday Pops concert on Tuesday, December 4, at 7:30 p.m. at the Victory Theatre in Evansville, Indiana. The event, which will feature performances by UE students, faculty, soloists, and ensembles, is free and open to the public. This year’s concert includes performances by the University Orchestra, Choirs, Wind Ensemble, and University Band, as well as some special guests and surprises. Holiday favorites will be performed, including Winter Wonderland, Tomorrow Shall Be My Dancing Day, The Night Before Christmas, and Sleigh Ride, and the audience will be invited to join in on the traditional sing-a-long. The UE Jazz Ensemble I will present the concert, Basically Basie, on Tuesday, November 27 at 7:30 p.m. in Wheeler Concert Hall on the University of Evansville campus The concert is free and open to the public and will feature music solely from the Basie library. Tickets are available for both preferred seating and a post-concert reception. The fee to attend the reception is $25. Contact the University of Evansville's Department of Music office at 812-488-2754 or at www.uealumnionline.com/basie for more information. All proceeds benefit the UE Department of Music. University of Evansville professor of music Timothy J. Zifer guest conducted the Indiana Band Masters Association All Region Honor Band in Spencer, Indiana, this past weekend. The band was made up of 100 students from 12 different school districts. The students had rehearsals and sectionals all day Saturday. A Sunday rehearsal followed by a concert. Zifer had the opportunity to interact with students, parents, and regional music educators during the event. University of Evansville music professor Chun-Ming Chen was invited to guest conduct the Indiana American String Teacher’s Association Central All-Region Honor Orchestra on November 3 at Hamilton Southeast High School. University of Evansville music professor Kenneth Steinsultz served as guest conductor for the Middle Level Band Festival at St. Norbert College recently. The event included talented musicians in grades 7-9 from Wisconsin and Michigan. Kristen Strandberg, Univeersity of Evansville assistant professor of music history, presented at the Nineteenth-Century French Studies conference in Los Angeles on October 26. Her presentation, “’Pour le plaisir des yeux’: Musical Celebrity as a Visual Phenomenon in Nineteenth-Century France,” discussed how critics and audiences often focused more on the visual aspects of musical performance than the aural. Leanne Hampton, University of Evansville instructor of flute, was awarded third prize in the Colorado Flute Association’s 2018 Young Artist Competition. Her program included works by C.P.E. Bach, Sigfrid Karg-Elert, Paul Taffanel, and Valerie Coleman. UE Opera presents "Coffee Cantata" and "Riders to the Sea"
The Schmidt Opera Series at the University of Evansville returns Friday, October 12 and Saturday, October 13 at 7:30 p.m., in Wheeler Concert Hall with a double bill of Bach and Vaughan Williams. In Bach's Coffee Cantata, we have a comic telling of a father struggling to get his daughter to give up her coffee habit. The mood shifts drastically with the second opera, Vaughan Williams' Riders to the Sea. This tragic opera, based on the play by J.M. Synge, tells of an Irish mother whose last remaining son is determined to go to sea despite her pleadings for him to stay at home. Tickets for the opera are $10. The UE Shepard Brass performed in Carnegie Hall in Moores Hill, Indiana, on Saturday, September 22 for Moores Hill’s Bicentennial Celebration. UE was invited to participate in the celebration because of the University's connection to the town. Moores Hill College was moved to Evansville in 1919 and became Evansville College, and then later was renamed the University of Evansville..
Members of Shepard Brass include Timothy Zifer, Kevin Wilson, Emily Britton, Kenneth Steinsultz, Joshua Britton, and Ross Erickson. Mohammad K. Azarian, University of Evansville professor of mathematics, published a paper entitled, Risala al-watar wa'l jaib ("The Treatise on the Chord and Sine")-Revisited, in Forum Geometricorum. The purpose of this paper was three-fold. First, Azarian used Jamshid al-Kashi's [Kashani's] famous cubic equation and a mathematica program to calculate sine of one degree to over 11,200,000 decimal digits of accuracy; an amazing improvement over the 17 digits of accuracy that Kashani found by pencil and paper in 1426. Then, Azarian conjectured that Kashani's cubic equation can be used to calculate sine of one degree to any desired accuracy. Second, Azarian set the record straight about the number of correct digits obtained by Kashani that were reported in many previous studies. Third, Azarian commented on some statements that he made in his previous paper on this topic. UE graduate Bryan Sherlock, a chief warrant officer 3 and former fleet Marine Corps band officer, has been promoted to captain as he becomes the first Marine Band assistant director to be appointed from the officer corps of the Fleet Marine Force. Sherlock earned a bachelor’s degree in music education from UE in 1991. In 1995 he earned a master’s degree in trombone performance from Butler University in Indianapolis and served as principal trombone in the Lafayette Symphony Orchestra while also performing in other orchestras and brass quintets. He enlisted in the Marine Corps in November 1996 and graduated from Marine Corps Recruit Depot San Diego as the Company Honor Graduate in 1998. Throughout his career he continued to flourish at the Armed Forces School of Music in Little Creek, Va., and as part of leadership in several field bands and at The Basic School for Marine Officers in Quantico, Va.
As assistant director, Sherlock’s responsibilities include conducting the Marine Band and Marine Chamber Orchestra in their winter/spring concert series and summer concerts on the National Mall as well as at ceremonies in the national capital region and at the White House. Additionally, he serves as a supervisor for the acclaimed fall and winter Chamber Music Series, which features the virtuoso musicians of “The President’s Own,” as well as all pre-concert music. Rico Martinez is this year's winner of the Music Service Award, and Bailee Bostic is this year's winner of the Presser Award. Martinez is a sophomore majoring in music education at the University of Evansville, and Bostic is a junior majoring in music therapy at UE. The Music Service Award was established by a supporter of our department in 2014, and is designed to recognize and provide a financial award to a student who has participated in at least three ensembles each semester during an academic year, who has exhibited a positive attitude, and who has been inspiring to others. The student selected for this award must demonstrate dedication, consistent motivation, a high standard of performance and a positive attitude. The Presser Foundation was formally established in 1939 under various deeds of trust of the late Theodore Presser, who was a respected music teacher and publisher. In the charter of incorporation, The Foundation’s purposes are set forth to promote primarily the cause of musical education and musical philanthropy as follows: to provide scholarships for promising students; to increase the value of music education by erecting suitable buildings; and to administer aid to worthy teachers of music in distress. The award is intended to be a prestigious one recognizing excellence. The student selected should be identified by the music faculty with the choice of the recipient guided solely by consideration of excellence and merit. The winner receives a scholarship from the Presser Foundation, and is designated as the Music Department’s Presser Scholar for the coming year. University of Evansville music professor James Sullivan recently made a presentation at the 20th- and 21st-Century Song Cycles for Voice and Piano Conference at Michigan State University. His presentation "The Queer Context and Composition of Samuel Barber's 'Despite and Still'" discusses the impact that particularities of Barber's relationship with Gian Carlo Menotti had on Barber's choice of texts for the cycle, as well as his musical setting of them. The University of Evansville Orchestra will present an all-Beethoven concert on Tuesday, April 3, at 7:30 pm. The concert will be held at Victory Theatre, located at 600 Main St, Evansville, Indiana. The concert is free and open to the public. UE faculty soloists Robert Anemone, violin, Kirsten Jermé, cello, and Garnet Ungar, piano, will join the orchestra in the rarely-heard Triple Concerto, following a performance of the Coriolan Overture. The concert will be conducted by UE assistant professor/director of orchestral activities Chun-Ming Chen. Following the concert, the orchestra will embark on a four-concert tour of high schools in Tennessee. For more information, please call 812-488-2881 or e-mail cc319@evansville.edu. Associate professor of music and director of choral activities Dennis Malfatti’s article on Handel’s Saul is the featured cover article for the April 2018 edition of the Choral Journal. The Choral Journal goes to all members of the American Choral Directors Association, which has about 22,000 members. Logan Tsuji, junior trumpet performance major, won an Outstanding Soloist Award at the 51st Annual Elmhurst College Jazz Festival on Saturday, February 24. Tsuji's solo work on Duke Ellington's Concerto for Cootie won accolades from the judges at the festival. UE Jazz Ensemble I attended the long running festival and performed several works by noted jazz composers and arrangers. UE music professor Garnet Ungar and guest artist Roger Wright will give a recital of piano duos on Tuesday, February 13 at 7:30 p.m. in Wheeler Concert Hall. The program will feature works by Bach, Mozart, Schubert, and Rachmaninoff. The concert is free and open to the public. For complete program information and more information about the guest artist, visit the music department concert calendar. University of Evansville professor of music Garnet Ungar's book Inner Voices has been nominated for the 2018 Association for Recorded Sound Collections Awards for Excellence in Historical Recorded Sound Research. Assistant professor of music history Kristen Strandberg contributed an essay to conference proceedings recently published by the National Chopin Institute in Warsaw, Poland. The volume’s essays demonstrate the ways in which vocal music influenced instrumental music in the nineteenth century. Strandberg’s essay is titled “The ‘Singing’ Violinist as Artistic Genius in Nineteenth-Century France. University of Evansville assistant professor of music Shawn Teichmer was invited to adjudicate the East Central Division Wind Competitions for the Music Teachers National Association. He judged Chamber Winds, Senior Winds, and the Young Artist Wind Competition at the event, which was held at the University of Illinois at Urbana-Champaign on January 8. The University of Evansville Department of Music invites the public to ring in the holiday season at the annual Holiday Pops Concert. For nearly four decades, students, faculty, and soloists have shared their talent and celebrated the spirit of the season with music. This year - for the first time - the concert will be presented both in Evansville and in Henderson, Kentucky. Both presentations are free and open to the public. The Evansville concert will be at the Victory Theatre downtown, at 7:30 p.m. on Tuesday, December 5. This presentation is made possible through the generosity of Mesker Music Trust by Fifth Third Bank, trustee. The Henderson concert will be at the Preston Arts Center at 7:30 p.m. on Wednesday, December 6. This presentation is part of a budding partnership with the center. Assistant professor of music history Kristen Strandberg will travel to Rochester, New York, to present at the conference of the international Francophone Music Criticism Network. Her paper discusses nineteenth-century French music critics’ belief that altruism and charitable giving were essential components of the true musical/artistic genius. Jim Bovinett, professor of trumpet, will be hosting the Trumpet Summit on the campus of Iowa State University in Ames, Iowa, on Saturday, November 4. The University of Evansville Trumpet Ensemble has been invited to be guest performers and participants at the event. Timothy Zifer, UE professor of music, will direct the trumpet ensemble, serve as a guest clinician, and also perform on the faculty recital. University of Evansville associate professor of music Garnet Ungar, who recently co-wrote an autobiography of his teacher, revered pianist Abbey Simon, presented a book launch and signing at Yamaha Artists Services Salon in New York City on October 20. The book is available for purchase on Amazon by searching Abbey Simon Inner Voices. Leanne Hampton, University of Evansville instructor of flute, presented a masterclass and workshop for the flute studio of Colleen White at Metropolitan State University in Denver, Colorado. University of Evansville violin professor Carol Dallinger recently served as guest clinician at the 10th Annual Violin Workshop of the Middle Tennessee Suzuki Association, in Nashville..
University of Evansville professor emeritus Ed Lacy has been chosen as the Kenny Kent Lexus Jazz Musician of the Year. He will be presented with an award onstage on Saturday, September 16 at the Lexus Jazz & Wine Festival in downtown Evansville. The Indiana Music Education Association (IMEA) will be hosting the Southern Indiana Symposium & Clinic, a full-bodied professional development event for educators, at the University of Evansville on Thursday, August 31. It will offer sessions for all levels of music educators in band, orchestra, choral, and general music. Featured sessions include “Bring Your Men”, a choral/vocal workshop bringing middle school and high school male choral singers to campus to work with Dan Anderson of Anderson University and author of choral methods published by Hal Leonard. Additional clinicians leading sessions for choral educators are Angela Hampton and David Stone. The Symposium will take place in the Krannert Fine Arts Building beginning with registration at 8:00 a.m. and concluding at 4:00 p.m. This event is open to both IMEA members as well as non-members. For more information go to: music.evansville.edu. Her duties will include advancing technical riders, serving as a liaison with guest artists and managers, working backstage, training an NSO Operations Intern, and assisting with televised concert broadcasts at the Capitol. Previously Von Der Heide was assistant production manager with the Sarasota Orchestra. She graduated from UE in 2015 with a degree in music management. The Department of Music at the University of Evansville was recently granted renewed accreditation by the National Association of Schools of Music (NASM). UE’s music department has been accredited since 1948. Founded in 1924, NASM is an organization of schools, conservatories, colleges, and universities with approximately 650 accredited institutional members. It establishes national standards for undergraduate and graduate degrees and other credentials for music and music-related disciplines. It provides assistance to institutions and individuals engaged in artistic, scholarly, educational, and other music-related endeavors. Accreditation by NASM is the result of a comprehensive review process. The institution must meet specific standards in a variety of areas, including degree programs offered, general operations, and facilities. An intense self-study by UE’s music department was submitted to NASM in January 2015. UE then hosted a site visit with NASM in March of that year. Josenhans noted that UE has five degrees that are accredited by NASM - Bachelor of Science in Music, Bachelor of Science in Music with an emphasis in Music Management, Bachelor of Music in Music Therapy, and Bachelor of Music in Performance. Mary Ellen Wylie, professor of music at the University of Evansville, was named the 2017 Outstanding Teacher at the University during today’s UE’s 159th Commencement exercises. UE alumni value the exceptional education they received here. To encourage continued excellence, the Alumni Association sponsors this award honoring distinguished service in teaching. Wylie came to UE in 1991. She earned her undergraduate degree in music education from the University of Wisconsin-Madison and her advanced degrees from the University of Kansas. She is an experienced music therapist having worked with children with severe developmental delays and multiple handicaps, adults with mental handicaps, the elderly and terminally ill, and patients with cancer. Wylie is past president of the American Music Therapy Association and has served a number of years on the board of directors and executive committee of that organization. In March 2010 she was awarded the Honorary Life Member award from the region for distinguished contributions made over the years. She has given numerous presentations locally, as well as at national, regional, and state music therapy conferences. She has been published in the Journal of Music Therapy and Music Therapy Perspectives. As director of UE’s music therapy program, Wylie teaches courses in music therapy, supervises music therapy practica, and coordinates internships. A record number of nominations for this year’s award were submitted for Wylie, not only from students, but also from alumni and fellow faculty members. The American Choral Directors Association (ACDA) chose the University of Evansville to represent the state of Indiana in the National Collegiate Honor Choir which took place last month in Minneapolis, Minnesota, as part of the 2017 American Choral Directors Association National Conference. The ACDA National Collegiate Choir featured one quartet from each of the 50 states for a total of 200 singers. Dennis Malfatti, director of choral activities, was asked by ACDA to prepare and bring four singers from UE for this event. Senior vocal performance and music therapy major Rebecca Laskey, senior music therapy major Cynthia White, junior vocal performance major Adam Smith, and freshman music education major Griffin Devoy were selected as the quartet to represent UE and the state of Indiana as a whole. The students were rehearsed and prepared by Malfatti in the weeks leading up to their trip to Minneapolis. Even though only four students from each state could attend, this distinction was the result of recent achievements by all the members of UE’s choral program and the increasing recognition of UE’s choral program from ACDA, the nation’s largest and primary professional organization for choral music. 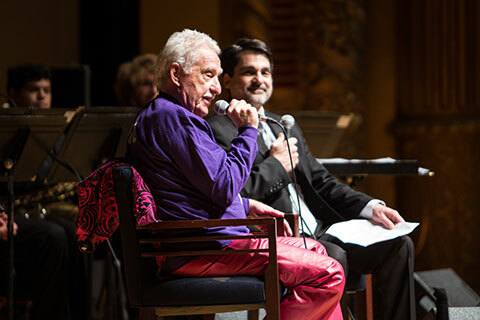 Donning a bright pink suit true to his signature style, former leader of The Tonight Show Band Doc Severinsen took the stage with students in the University of Evansville Jazz Ensemble I to play to a packed Victory Theatre Tuesday night. The event was part of UE’s Patricia H. Snyder Concert and Lecture Series, which brings renowned acts or speakers to Evansville at no cost to the public. Selections included Max Anderson’s September Song, Hoagy Carmichael’s Georgia, a big band arrangement of Soundgarden’s Black Hole Sun, and a Tonight Show Band’s rendition of a Count Basie favorite, 12 O’clock Jump. There are six freshmen, nine sophomores, and three seniors in the UE Jazz Ensemble I. 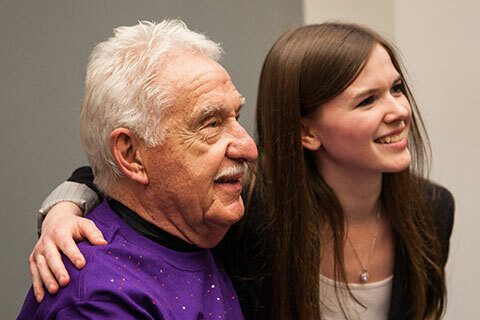 As part of the Patricia H. Snyder Concert and Lecture Series, jazz legend Doc Severinsen and the UE Jazz Ensemble played to a packed Victory Theatre on Tuesday, April 4. 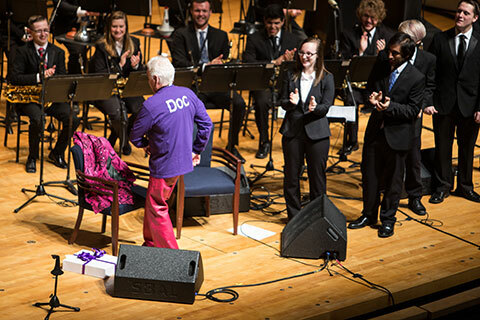 Doc exchanged his vibrant pink jacket for a bedazzled purple shirt, a gift from the trumpet section of the UE Jazz Ensemble. Three University of Evansville Department of Music faculty members will be celebrated at the Friends of UE Music’s annual Rite of Spring Gala this year. Renato Butturi, John Jordan, and Edwin Lacy will be honored for over a century of teaching excellence at UE. Tickets are $65 per person and are available now. For tickets or more information and to register on-line at www.evansville.edu/RiteOfSpring/ or call 812-488-2754. UE director of bands Kenneth Steinsultz was conductor of the High Plains Festival Honor Band at Chadron State College in Chadron, Nebraska, on February 6-7. The band was selected by audition of students from high schools in Nebraska, Wyoming, and South Dakota. Consortium professor of flute Cara Dailey won first prize in the biennial Piccolo Artist Competition at the 2016 National Flute Association Convention in San Diego, California. As a competitor, Dailey performed two recitals at the convention - first as one of six semifinalists, and then as one of three finalists. Each recital consisted of different repertoire, including works by Antonio Vivaldi and Robert Beaser, as well as Stephen Hough’s Paradise, a new work commissioned for the 2016 Piccolo Artist Competition. Anne Hastings Fiedler, professor of music, and the Eykamp String Quartet, resident artists of the University of Evansville and the Evansville Philharmonic Orchestra, will be honored at the 2016 Mayor's Arts Awards Ceremony on Thursday, August 18, at the Victory Theatre. The Arts Council of Southwest Indiana's annual Arts Awards honor individuals, groups, and institutions that have made significant contributions to the advancement of the arts in Evansville and the surrounding counties. Fiedler will receive the Artist Award, and the Eykamp String Quartet will be recognized with the Ensemble Award. On June 5, Dennis Malfatti, associate professor of music and director of choral activities at the University of Evansville, conducted a concert at the historic Carnegie Hall in New York City, along with students from UE’s choral program. The concert featured The New England Symphonic Ensemble (an east-coast based professional orchestra), and a chorus of over 120 voices in a program of choral-orchestral works by Mozart and Haydn. The chorus was made up of singers from several different choirs from Indiana, Ohio, Pennsylvania, and Virginia. All the participating choirs, each of which learned the music for the program with their own directors, met in New York City two days prior to the concert for two combined rehearsals as well as a rehearsal with the orchestra all led by Malfatti. Carnegie Hall is the most famous concert hall in the United States and one of the most famous halls in the world. Nearly every major classical music artist of repute from the last 100 plus years has performed there. This recent performance was the second time Malfatti and students from the UE choral program have been invited to perform on the storied stage of Carnegie Hall, having performed a similar concert in 2011. The Department of Music at the University of Evansville will present its annual Holiday Pops concert on Tuesday, December 8. The event begins at 7:30 p.m. in the Victory Theatre in downtown Evansville. This concert is free and open to the public. The concert program will feature the University Choir, the Men’s and Women’s Choruses, the UE Symphony Orchestra, the UE Wind Ensemble, and the UE String Ensemble performing separately and in various combinations. Director of Choral Activities Dennis Malfatti, Director of Orchestra Activities Jessica Morel, and Director of Bands Kenneth Steinsultz will lead the ensembles in a program of traditional and popular holiday favorites. Assistant Professor of Music Alana Keenan will sing during the event. The University of Evansville has received a $60,000, three-year grant from the William E. Schmidt Foundation for the Schmidt Opera Series and Opera Outreach Program. The Schmidt Opera Series will expand to include two annual full-scale main stage productions, the use of an orchestra during the spring production, and an increased budget for costume, set design, and other technical elements. Through the Schmidt Opera Outreach Program, UE’s Department of Music will be able to increase visibility for the Schmidt Opera Series through off-campus performances. UE plans to bring opera to students across the Tri-State area in their schools, the elderly in nursing homes, and in run-out performances in the Evansville community. The University would like to thank the William E. Schmidt Foundation for their commitment to the arts, and the generosity of their grant. As one of only a handful of universities that offer an undergraduate opera theater program, UE is proud to be able to give students the opportunity to hone their craft while simultaneously bringing music and performance to the greater Evansville community. Several members of the University of Evansville community were recipients of this year’s Arts Council of Southwestern Indiana Awards. The awards were presented on Tuesday, June 23, at a ceremony at the Bower-Suhrheinrich Foundation Gallery at the Arts Council of Southwestern Indiana in Evansville. Sharon Kazee, UE’s first lady, was the recipient of the Arts Council Educator Award. Kazee, who earned her PhD in educational administration from the University of South Carolina, has used her academic background and research to highlight issues of arts education. She has worked to advocate for inclusion of the arts in STEM (science, technology, engineering, and mathematics) education to create STEAM (science, technology, engineering, arts, and mathematics) education. She is a board member of the Signature School, the Evansville Philharmonic Orchestra, the Evansville Public Art Commission, the Evansville Museum, the University of Evansville Art Collection Committee, the University of Evansville Theatre Society, and other organizations. Edwin Lacy, UE professor emeritus of music, was given the Artist Award. Lacy retired from the University in 2008 but continues to teach at UE as an adjunct. He served three terms as chair of UE’s Department of Music. He began the Jazz Artist Series, helped reinvigorate the Evansville Jazz Society, and founded the UE Jazz Program and was its director for 40 years. While at UE, he received such honors as the Oramay Cluthe Eades Distinguished Professor of Music and the Dean’s Award for Excellence in Teaching. Lacy is principal bassoonist of the Evansville Philharmonic Orchestra, and a member of the Harlaxton Woodwind Quintet. Douglas Reed, UE professor emeritus of music and organist emeritus, also received an Artist Award. Reed provides music for major UE celebrations and performs in major world cultural centers and for educational institutions and chapters of the American Guild of Organists. While at UE, Reed received the Sadelle and Sydney Berger Award for Scholarship and a Global Scholar grant for the study of global Christian song. Recently the Evansville Chapter of the American Guild of Organists honored Reed by commissioning a new work for organ and brass quintet from composer William Bolcom. In April, Reed performed the world premiere of the work with the American Brass Quintet. Ling Lin received the Young Artist Award. Lin will begin her studies at the University of Evansville this fall. She plans to major in graphic design, with a minor in business. Lin has earned recognition as a young artist in many competitions. Her work has been displayed at the Mead Johnson District Art Show, the Evansville Museum High School Art Show, the PTA Reflections competition in Indianapolis, and in private homes. She recently won the 2015 Congressman Larry Buschon’s Indiana 8th District art competition and as a result, her painting of a riverfront skyline will hang in the US Capitol for one year. Scott Wylie was the recipient of the Arts Advocate Award. Wylie is an adjunct instructor at UE and a member of the University’s Theatre Society and Neu Chapel Society board of directors. He is executive director of the Vanderburgh Community Foundation, which was chosen by the Indiana Arts Commission as District 10 Regional Partner primarily because of his leadership in embracing the arts. Since this designation, the number of art related applications submitted to the foundation has greatly increased. Wylie is also past president of the USI Society for Arts and Humanities and has served on the Board of Advisors of the New Harmony Gallery for Contemporary Arts. UE alum Timothy Dickel accepted the Ensemble Award on behalf of the Mater Dei Marching Wildcats. Dickel is executive director at Mater Dei High School. A Special Recognition Award was also given to Cypress and related partners, which included the University of Evansville. The award was given to recognize a wide range of arts and humanities programs that focused on the heroes, survivors and victims of World War II. Presented by Karen Mercer, MS. Participants will learn how to orchestrate simple folk songs using Orff Instrumentarium. The Department of Music at the University of Evansville will present its annual Holiday Pops concert on Tuesday, December 9. The event begins at 7:30 p.m. in the Victory Theatre in downtown Evansville. This is the 35th year for the concert, which is free and open to the public. Director of Choral Activities Dennis Malfatti, Director of Orchestral Activities Brian St. John, and Director of Bands Kenneth Steinsultz will lead the ensembles in a program of traditional and popular holiday favorites. Associate Professor of Piano Garnet Ungar and Assistant Professor of Voice Eric McCluskey will also participate. The University of Evansville's Eykamp Quartet-in-Residence will perform a recital with violist Atar Arad on Tuesday, September 9 at 7:30 pm in Wheeler Concert Hall. The Tuesday night program will feature a string quartet by Mozart, a string quartet by Arad, and the Dvorak Viola Quintet op. 97. Arad was the violist of the Cleveland Quartet for seven years, taught at the Shepherd School at Rice University, and is currently professor of viola at the Indiana University Jacobs School of Music. In addition to a full teaching and performing schedule, Arad is a prolific composer, and has written a viola concerto, viola sonata, 12 viola caprices inspired by famous viola works, as well as numerous chamber pieces. The Department of Music wants to let everyone know that auditions are being held this week for Department ensembles. Those interested can check bulletin boards in the north hall of Krannert Hall of Fine Arts for more details. Sign-up sheets for most ensembles are available on the respective bulletin boards. The ensembles are open to both music majors and non-majors. UE Jazz Ensemble Auditions will be held on Wednesday evening, August 27, from 7:00 to 9:30 p.m. Auditions will consist of major scales (drums will play styles), audition excerpts, and sight reading. Support the Alzheimer's Association® through music at The Longest Day,® Saturday, June 21, in Krannert Hall of Fine Arts at the University of Evansville. This special event, hosted by UE’s Music Therapy program, starts at 7:00 a.m. and ends at 10:00 p.m. Participants can enjoy a full day of music activities or just spend part of their day at the event. The day starts with coffee and a social hour, followed by music activities, including drum circles, Karaoke, musical bingo, pick-up band and choir. The festivities conclude with an open mic night. All ages are welcome! The activities are free and open to the public. Donations to the Alzheimer’s Association will be accepted at the event. For more information, contact Kathy Murphy at 812-488-2880 or km301@evansville.edu. The University of Evansville Department of Music has announced the dates for the 4th annual Wesley Shepard Summer Music Camp. The camp will be held on the UE campus from June 22-28 and will include both band and orchestra divisions. It is open to any middle or high school student who has completed at least one school year of either band or orchestra. Students will have the opportunity to work with UE music faculty and other professional music educators from the Evansville area. The week will culminate with performances by the camp ensembles on the campus of the University of Evansville. Aside from ensemble rehearsals, students will have the opportunity to study music theory in a small class setting. The students will also choose an elective from a list of options that include jazz band, chamber music, and conducting. Day camp tuition ($195) includes lunch each day in the Ridgway Student Center, as well as recreation time using the UE recreation and athletic facilities. Overnight camp tuition ($450) will also include six nights stay in the dormitories and three meals per day, plus additional evening activities and guest performances. To receive additional information please visit the Department of Music website and click the green Summer Music Camp link, or contact Dr. Brian St. John at bs191@evansville.edu. The University of Evansville and Evansville Philharmonic Orchestra are excited to announce “Chamberpalooza!,” a concert featuring the winners of the first annual Eykamp String Quartet chamber music competition. The concert will include works by Mozart, Glazunov, Barber, Foote, and Schnittke, and is set for Thursday April 10, at 6:00 pm in Wheeler Concert Hall on the UE campus. The program will also feature performances by the EPYO Mentorship Quintet, a chamber music group comprised of students from the youth orchestra and coached by the ESQ. Members of the 2013-14 Mentorship Quintet are Ian Sponseller and Meredith Walling, violins; Jimmy Schraeder, viola; and Adam Willett and Karin Roberts, cellos. UE music majors and students from the Evansville Philharmonic Orchestra competed in the Eykamp String Quartet competition, playing a movement of chamber music with the Quartet. Out of the great number of impressive auditions, four student performers were chosen. This year’s EPYO winners were clarinetist Corinna Waggoner and flutist Ellen Backer. Winners from UE were pianist Josh Kight and baritone Ian Murrell. Celebrate April Fool's Day with the faculty of the University of Evansville Department of Music as they present a concert titled “A Musical Joke.” The concert will occur at 7:30 PM on Tuesday, April 1 in Wheeler Concert Hall and is free and open to the public. The program will feature humorous works from the classical repertoire including Mozart’s “Musical Joke” for string quartet and 2 french horns, PDQ Bach’s “The Art of the Ground Round,” and “Sonata for Viola 4-hands and Harpsichord,” Jan Bach’s “2-Bit Contraptions,” “Isoldina,” by Clément Doucet, “Subadobe IV” by Fredrick Högberg, “Bach at the Double” by Teddy Bor, and “The King of Instruments” by William Albright. Faculty members performing are William Bootz, Alicia Choi, Cara Dailey, Carol Dallinger, Anne Fiedler, Barbara Josenhans, Douglas Reed, Gregory Rike, Schuyler Slack, Kenneth Steinsultz, Jon Truitt, Jessica Tong, Garnet Ungar, Lee Veazey, Jennifer Wingert, Rose Wollman, and Marc Zyla. Two internationally acclaimed chamber musicians, violist James Dunham and cellist Michael Kannen, will collaborate with the University of Evansville’s resident faculty Eykamp String Quartet in an upcoming performance. The concert, featuring Arnold Schönberg’s chamber music masterpiece Verklärte Nacht, will take place in the University of Evansville’s Wheeler Concert Hall at 7:30 p.m. Sunday, February 16 and it is free and open to the public. Violist James Dunham’s rich background includes having been founding member of the Naumburg Award-winning Sequoia String Quartet and violist of the Grammy Award-winning Cleveland Quartet. An impassioned advocate of new music, he has premiered and recorded several works written for him by American composer Libby Larsen. Dunham is currently professor of viola and chamber music at Rice University’s Shepherd School of Music, where he also co-directs its Master of Music in String Quartet program. Cellist Michael Kannen was a founding member of Brentano String Quartet and is currently a member of the Apollo Trio. During his years with the Brentano Quartet, the group was awarded the first Cleveland Quartet Award, the Naumburg Chamber Music Award, and a Royal Philharmonic Award, and was the first participant in the Chamber Music Society of Lincoln Center II. Kannen is currently the director of chamber music at the Peabody Conservatory of Music, where he holds the Sidney Friedberg Chair in Chamber Music.?? Appearances by Dunham and Kannen are part of the UE Department of Music’s Friends Series and are made possible through the generosity of Friends of UE Music. For more information, please contact the Department of Music at 812-488-2754. The Department of Music at the University of Evansville will present its annual gift to the community – the Holiday Pops concert – next week. This festive celebration of the holiday season will begin at 7:30 p.m. Tuesday, December 10 at the Victory Theatre in downtown Evansville. The 34th annual concert is free and open to the public. 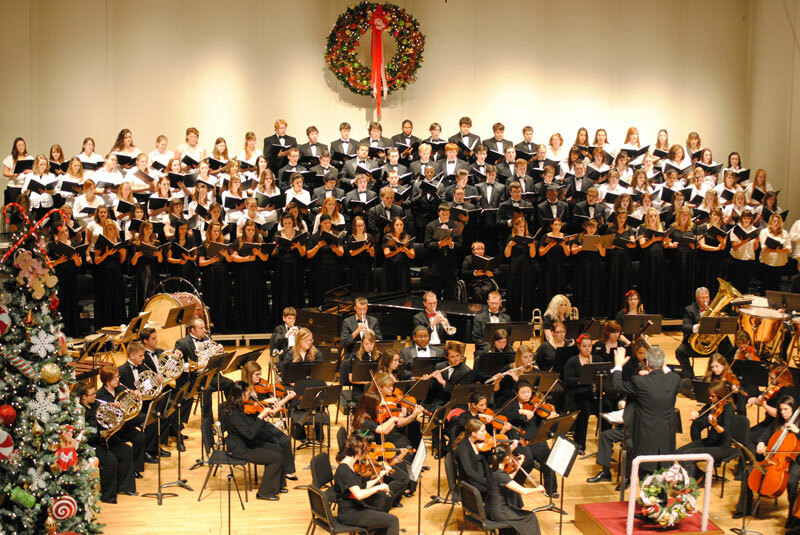 Holiday Pops brings together UE ensembles and soloists to perform holiday music. The evening includes performances by the University’s choirs, orchestra, and wind, brass, and jazz ensembles. This year’s program features students and faculty members performing sacred and secular musical selections, ranging from “Greensleeves” to “Sleigh Ride” to music from Tchaikovsky’s The Nutcracker ballet. Hailed as “one of the most exciting trumpet players on the planet” by the International Trumpet Guild Journal, Graham Breedlove will be the featured guest artist in the University of Evansville Department of Music’s next First Tuesday Concert. Breedlove will join the UE Jazz Ensemble, under the direction of Timothy Zifer, for a performance at 7:30 p.m. Tuesday, December 3 in Wheeler Concert Hall. Like all events in the First Tuesday Concert Series, this concert is free and open to the public. Breedlove will perform several of his own compositions and arrangements including “Bayou Farewell” and “Festival Time in the Ville.” Other selections for the evening include works by Nestico, Allen, Baker, and Lohorn. Since taking up the trumpet at age 12 in his hometown of Lafayette, Louisiana, Breedlove has performed on four continents and in more than 20 countries, with headliners such as The Saturday Night Live Band, Ray Charles, Wynton Marsalis, Ramsey Lewis, Darius Rucker, and Doc Severinsen. The Graham Breedlove Quintet appears regularly at the Kennedy Center, and was recently invited by the Obama administration to perform at the White House. Currently, Breedlove is a trumpet soloist with the Army Blues jazz ensemble, part of the United States Army Band in Washington, D.C. Breedlove also presents clinics and master classes and appears as a guest soloist at colleges and universities across the country. For more information on this concert or events in the First Tuesday Concert Series, please contact the Department of Music at 812-488-2754. For a full list of upcoming events, please visit the department’s online concert calendar. This Saturday, University of Evansville students will share the stage with some of the nation’s leading opera singers in the Evansville Philharmonic Orchestra’s production of Puccini’s Madame Butterfly. The performance will take place at 7 p.m. Saturday, November 23 at the Victory Theatre in Downtown Evansville. Tickets start at $23 and may be purchased on the EPO’s website, www.evansvillephilharmonic.org. 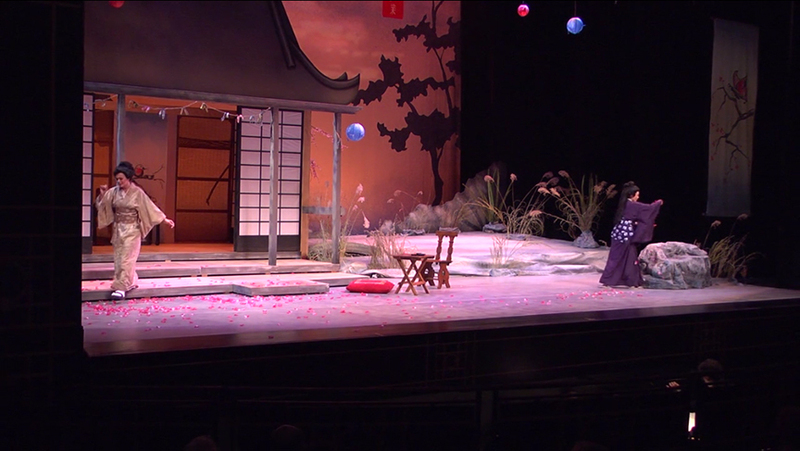 Sung in Italian, with an English translation projected above the stage, Madame Butterfly features a full set from Asheville Lyric Opera in North Carolina and costumes from Union Avenue Opera in St. Louis. Four professional opera singers will perform the lead roles, with approximately 20 UE students and additional members of the Evansville Philharmonic Chorus rounding out the chorus. “Performing in a professional production of Madame Butterfly, one of the world’s most beloved operas, is an incredibly meaningful opportunity for our students,” said Jon Truitt, associate professor of music and director of UE’s opera program, who staged the production of Madame Butterfly and will also perform a lead role. This weekend’s production of Madame Butterfly marks the first time in 10 years that the Evansville Philharmonic Orchestra has brought a fully staged opera to the Victory Theatre. Madame Butterfly was the orchestra’s first fully staged operatic production, performed to sold-out houses in 1999, and returns this year in celebration of Maestro Alfred Savia’s 25th season with the EPO. Madame Butterfly tells the story of a Japanese geisha who gives up everything she knows to marry an American naval officer. What results is a compelling clash of cultures, forcing the young bride to make an excruciating decision. The University of Evansville wishes to thank the Alcoa Foundation, Friends of UE Music, and the William E. Schmidt Foundation for their support of this production. The University of Evansville’s Department of Music will celebrate the birthdays of several prominent composers in next month’s installment of the First Tuesday Concert Series. The concert, titled “Composer Birthdays,” will take place at 7:30 p.m. Tuesday, November 5, in Wheeler Concert Hall. Like all events in the First Tuesday Concert Series, it is free and open to the public. November’s First Tuesday concert celebrates the fall birthdays of composers such as Benjamin Britten, Giuseppe Verdi, and Richard Wagner with performances of arias, chamber music, and more by 13 UE faculty members. The first half of the program features performances by the Harlaxton Woodwind Quintet and Shepard Brass Quintet. The second half includes selections from the operas Falstaff and La Traviata. The First Tuesday Concert Series, in its sixth season, showcases the talent of the University of Evansville’s music faculty as they perform works from seldom-heard masterpieces to beloved standards. All concerts are free and open to the public and take place on UE’s campus. 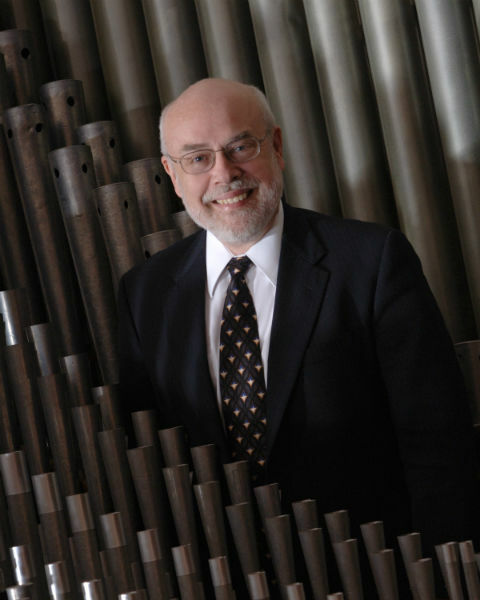 A recently discovered, unpublished composition of organ music, inspired by the art of James McNeill Whistler, will be the highlight of a faculty recital featuring Douglas Reed, UE professor emeritus of music and University organist. Reed will perform a free, public recital at 7:30 p.m. Tuesday, September 24, in UE’s Wheeler Concert Hall. In addition to traditional music by Bach, Buxtehude, Dupré, and Sweelinck, the recital will feature the Indiana premiere of a little-known composition by American composer William Albright: Whistler (1834-1903): Three Nocturnes. To date, the 20-minute piece, written in 1989, has only been performed at Harvard University, in Cleveland, and at the University of Wisconsin. It was inspired by three paintings by James McNeill Whistler: Nocturne in Grey and Gold: Chelsea Snow, Nocturne in Black and Gold: The Falling Rocket, and Nocturne in Blue and Silver. UE’s Reed studied under Albright at the University of Michigan, and the composer gave Reed a detailed program note about the work, which remained in manuscript form when he died. After Albright’s death, Reed discovered the composer’s sketches and hand-written performance score among Albright’s papers in the Bentley Historical Library at the University of Michigan. Working with these documents and a recorded performance of the work, Reed has re-notated and annotated the work in preparation for performances at the University of Evansville, at the Eastman Rochester Organ Initiative at the Eastman School of Music in Rochester, New York, on September 28, and for future publication. William Albright had a strong connection with the University of Evansville. The University commissioned two major Albright works: Four Fancies for Harpsichord (1979) with a grant from the Mesker Music Trust, and Symphony for Organ with Percussion (1986) with the support of the Friends of UE Music and a grant from the Indiana Arts Commission and the National Endowment for the Arts. Albright’s performances at UE included a Wheeler Concert Hall recital featuring piano jazz styles and the world premiere of his well-known Organbook III (1978-79) in Neu Chapel. Reed has taught at the University of Evansville since 1975 and performed extensively in the United States, Europe, and the Far East. His chapter, “North American Organ Music after 1800,” appears in The Cambridge Companion to the Organ (Cambridge University Press, 1998). Reed has received grants for commissioning new music from the Indiana Arts Commission and the National Endowment for the Arts, the Mesker Music Trust, and the University of Evansville. He is a past recipient of the University’s Sadelle and Sydney Berger Award for Scholarship. In observance of the United Nations’ International Day of Peace, the University of Evansville Department of Religious Life, International Club, Interfaith Council, and Neu Chapel Society will host a concert featuring a diverse group of local performers. The International Day of Peace Concert will take place at 4 p.m. Sunday, September 22 in UE’s Neu Chapel. Admission is free, but donations of non-perishable food items are requested. The concert will feature the Signature School String Orchestra, directed by Becky Simpkins; the North High School Choir, directed by Andrea Drury; the Joshua Academy Choir, directed by Monte Skelton; the First United Methodist Church Choir of Henderson, Kentucky, directed by Matthew Vanover; and University of Evansville music students and faculty. Each year, the International Day of Peace is observed around the world on September 21. UE’s concert is scheduled on the following day, September 22, to maximize participation by the campus and broader community. The United Nations General Assembly declared September 21 as a day devoted to strengthening the ideals of peace within and among all nations and people. The United Nations invites all to honor a cessation of hostilities during the day, and to commemorate the day through education and public awareness on issues related to peace. To inaugurate the day, the “Peace Bell” is rung at UN Headquarters in New York City. The First Tuesday Concert Series, presented by the Department of Music at the University of Evansville, kicks off its sixth season on September 3. The First Tuesday concerts, presented the first Tuesday of each month at 7:30 p.m., bring together the outstanding talent of the University’s music faculty to perform works from seldom-heard masterpieces to beloved standards. All concerts are free and open to the public and take place on UE’s campus (specific locations noted below). The 2013-14 series begins September 3 with the annual Fall Faculty Gala in Wheeler Concert Hall, which includes the presentation of the annual Friends of UE Music Distinguished Service Award to the UE Music Therapy program. October 1: Eykamp String Quartet, Wheeler Concert Hall. UE’s quartet-in-residence performs works from Mendelssohn, Bartok, and Mozart. November 5: Happy Birthday to…, Wheeler Concert Hall. This concert celebrates the birthdays of several prominent composers, including Giuseppe Verdi and Benjamin Britten, with performances of arias, chamber music, and more. December 3: An Evening of Jazz, Wheeler Concert Hall. 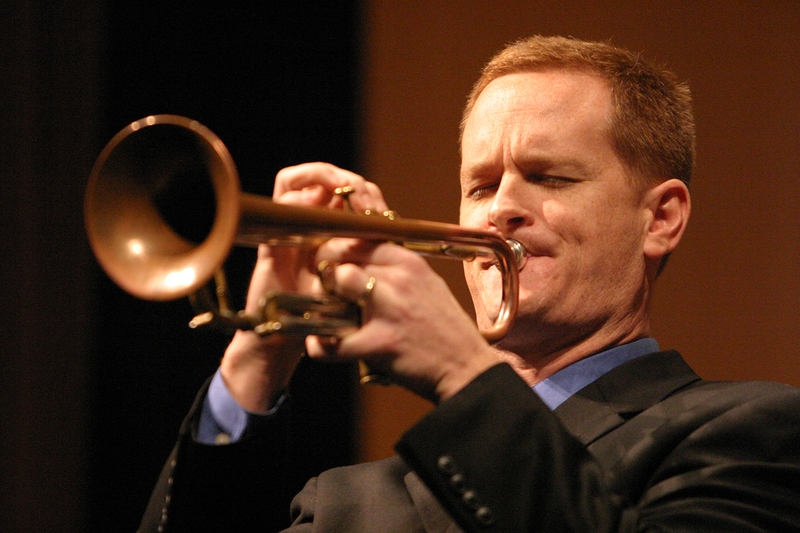 Jazz trumpet virtuoso Graham Breedlove, called “one of the most exciting trumpet players on the planet” by the International Trumpet Guild Journal, shares the stage with UE’s Jazz Ensemble I.
February 4: Mahler Songs, Wheeler Concert Hall. UE Department of Music faculty members perform Schoenberg’s chamber orchestra arrangement of Mahler’s Lieder eines fahrenden Gesellen, one of the most influential vocal orchestral works of all time. March 4: University Choir and Symphony Orchestra, Neu Chapel. Two of UE’s premier student ensembles join forces for a performance of Haydn’s powerful Te Deum. April 1: Musical Jokes, Wheeler Concert Hall. This April Fools’ Day-inspired celebration of humor in music features composers from Mozart to PDQ Bach, who have written music designed to make listeners laugh. For a full listing of UE Department of Music concerts, please click here. The University of Evansville had an excellent showing in this year’s Arts Awards, presented by the Arts Council of Southwestern Indiana. Faculty members and student performers in the Department of Music won two of the annual Arts Awards: Dennis Malfatti, associate professor of music and director of choral activities, was named Arts Educator of the Year, while UE Opera under the direction of Jon Truitt, associate professor of music, received the Ensemble of the Year Award. In addition, UE trustee Bob Jones and his wife, Lisa, were named Arts Advocates of the Year. 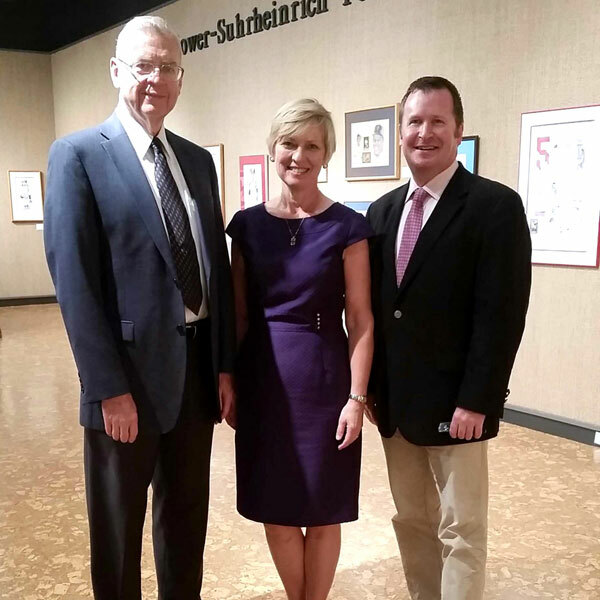 Arts Council leaders announced the honors June 27 at a news conference at the Bower-Suhrheinrich Foundation Gallery. With at least two fully staged productions a year, UE Opera provides performing opportunities for music and non-music majors alike. In addition to performing, students learn the mechanics of staging and the sheer labor of putting together a full production. Some UE Opera alumni have gone on to prestigious graduate schools and successful careers, and the program has also created greater opportunities for Tri-State families to experience opera without the time and expense of traveling to major cities. This fall, Truitt and the UE Opera will collaborate with the Evansville Philharmonic Orchestra in a fully staged production of Madame Butterfly. Under the direction of Dennis Malfatti, the Arts Educator of the Year, the choral program at UE has flourished. The University Choir is recognized as one of the outstanding choral groups in the state of Indiana, and in May 2011, Malfatti conducted the University Choir and choirs from Indiana, Kentucky, New York, and California for a performance of Haydn’s Paukenmesse at Carnegie Hall in New York City. In addition to his work at UE, Malfatti serves as director of music at Eastminster Presbyterian Church and directed the Evansville Philharmonic Chorus for four years. Bob and Lisa Jones, named the Arts Advocates of the Year, have been actively involved with the University of Evansville’s Department of Theatre, one of the nation’s top undergraduate theatre programs. Lisa served on the UE Theatre Society Board of Directors for six years, chairing numerous committees, in addition to serving as the president of the organization for two years. She has been awarded the Barbara St. Clair McKenna Award, the highest honor the UE Theatre Society can bestow. Bob and Lisa have been generous contributors to UE Department of Theatre and UE Theatre Society fundraising campaigns, and in 2011, they personally funded the idea of “flying the fairies” in A Midsummer Night’s Dream, through the expertise of ZFX Flying Effects. Bob and Lisa are dedicated theatre patrons and participate in the UE Theatre Society's Adopt-a-Student program. The Arts Awards will be presented at a banquet on Thursday, August 22 in the Walnut Atrium of Tropicana Evansville. A dragon, an evil queen, a trio of spirits, and love at first sight are just a few of the elements that make up W.A. 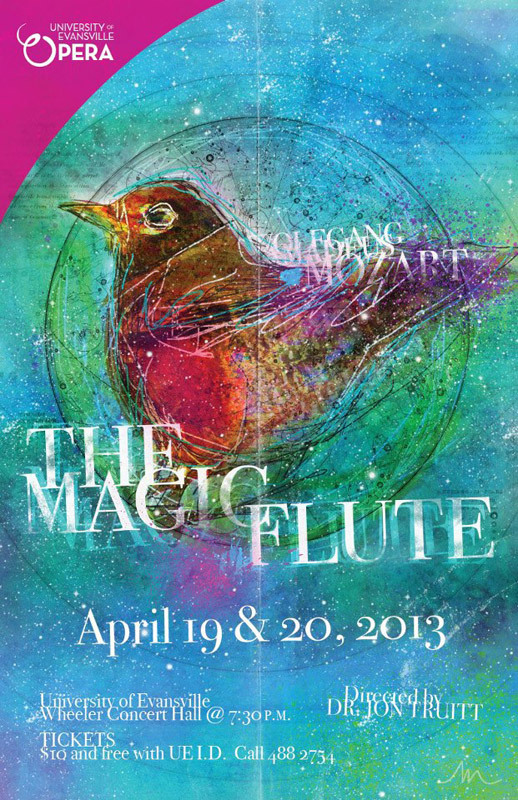 Mozart’s beloved opera The Magic Flute, which University of Evansville students will perform this weekend. Performances will take place at 7:30 p.m. April 19 and 20 in UE’s Wheeler Concert Hall. Tickets are $10 for general admission and free to UE students with ID. Tickets may be purchased at the door or reserved by calling the Department of Music at 812-488-2754. Sung in German (translated for the audience above the stage) with spoken dialogue in English, The Magic Flute features full costumes, sets, lighting, and accompaniment by piano, flute, and cello. The opera tells the story of a prince on a mission to rescue an enslaved princess – with help from a flute that has magical powers. The 29-member cast of The Magic Flute will perform under the direction of Jon Truitt, associate professor in UE’s Department of Music, who serves as head of the voice area and director of the opera program. The University of Evansville wishes to thank the William E. Schmidt Foundation, Alcoa Foundation, and Friends of UE Music for their generous support of this opera production. The Classical Guitar Society of Evansville and the University of Evansville will co-sponsor Guitar Fest, an annual concert that brings together local classical guitarists. The concert will take place at 7:30 p.m. Friday, February 22 in UE’s Wheeler Concert Hall. Tickets are $15 for the general public, $5 for any student, and free for UE students. The first half of the concert will feature an ensemble of 12 guitarists performing works by composers such as Georges Bizet, Leroy Anderson, and Manuel Penella. The second half will feature Evansville musician Eric Lund performing Latin music by composers including Heitor Villa Lobos, Antonio Lauro, and Federico Moreno Torroba. 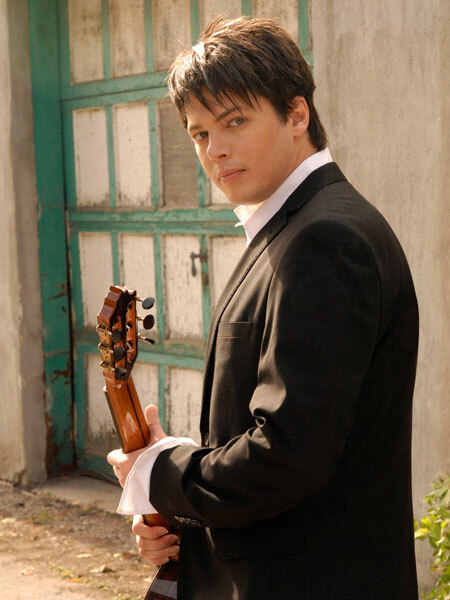 Lund, a native of St. Paul, Minnesota, began his classical guitar studies at age 14. He came to the University of Evansville to major in music therapy and study classical guitar with Renato Butturi. 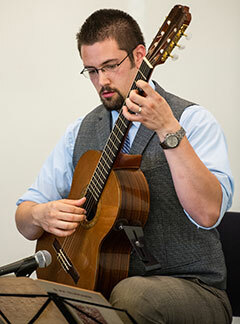 As a UE student, Lund attended guitar workshops at the University of Cincinnati’s College-Conservatory of Music, where he took master classes with Clare Callahan, Jeffrey Van, Stanley Yates, and Carlos Perez. During his senior year, Lund was a finalist for the Department of Music’s prestigious Gumberts Award, which honors the top performer in the senior class. After finishing his UE coursework in 2007, Lund completed a music therapy internship at Good Samaritan Home in Minneapolis, then returned to Evansville to accept a position with Integrative Music Therapy, a local private practice. He currently works as a music therapist for individuals with developmental disabilities. Lund is also a certified Music Together teacher for early childhood music classes, holds a credential in neurologic music therapy, and performs regularly on guitar at events throughout the Tri-State. For tickets or more information, please call UE’s Department of Music at 812-488-2754. The University of Evansville Music Management Association (UEMMA) will hold its second annual Swing Dance Fundraiser from 7-9 p.m. Wednesday, February 13 at the Old Courthouse in Downtown Evansville. The event includes dancing and live music, performed by the UE Jazz Ensemble. Drinks, finger foods, and desserts will be available, as well as a cash bar. The evening also includes a silent auction with items that have been donated by area restaurants and businesses as well as gift baskets made by band members. Proceeds from the event go toward UEMMA and UE jazz bands to help the groups travel to conferences and festivals, purchase equipment and music, and host guest speakers and artists on the UE campus. Tickets for the event are $20 and can be purchased by contacting Brittney Smith at 812-204-0339 or bs201@evansville.edu. February's First Tuesday Concert to Feature "The Music of New York"
February’s First Tuesday concert will take place at 7:30 p.m. Tuesday, February 5 in Wheeler Concert Hall. Like all events in the First Tuesday Concert Series, it is free and open to the public. The program features music written in, around, or about New York City. The program will open with the Eykamp String Quartet performing the first movement of Antonin Dvorak’s iconic “American” Quartet. Flutist Shauna Thompson will perform New York composer Eldin Burton’s Sonatina for Flute and Piano, and Marc Zyla, consortium instructor of horn, will play Leonard Bernstein’s Elegy for Mippy. The remainder of the concert includes selections from Broadway favorites, including West Side Story, Candide, and Little Johnny Jones, and UE faculty members Elizabeth Robertson, Anne Fiedler, Jon Truitt, Erzsebet Gaal, Stacey Uthe, Gregory Rike, Richard Williams, Ross Erickson, and Garnet Ungar. The First Tuesday Concert Series, in its fifth season, showcases the talent of the University’s music faculty as they perform works from seldom-heard masterpieces to beloved standards. For more information on this concert or events in the First Tuesday Concert Series, please contact the Department of Music at 812-488-2754. For a full list of concerts, please visit the department’s online concert calendar. The Classical Guitar Society of Evansville and the University of Evansville are pleased to present a performance by classical guitarist Daniel Bolshoy of Montreal, Canada, who will perform works by Eduardo Sainz de la Maza, Michael Karmon, Augustin Barrios Mangore, and Sergio Assad. The concert will begin at 7:30 p.m. Friday, January 25 in Wheeler Concert Hall on the University of Evansville campus. Admission is $15 for the general public, $5 for students, and free for UE students. Tickets are available at the door. Bolshoy is the head of the guitar division at the University of British Columbia School of Music. He is also the head of the guitar department at the Vancouver Symphony Orchestra School of Music. He has performed with international orchestras such as the Mexico City Philharmonic, the Toronto Philharmonia, the Edmonton Symphony, the Calgary Philharmonic, the New Mexico Symphony, the Vancouver Philharmonic, the Beer Sheva Symphoniette (Israel), and the Manitoba and Ottawa Chamber Orchestras. Bolshoy’s recitals are frequently broadcast on CBC Radio, and he has also appeared in two documentary films for the Bravo! (TV) series The Classical Now and appears on four commercial CD recordings. He performs solo and chamber music recitals in Canada’s most prestigious venues, including the Glenn Gould Studio, the Toronto Centre for the Performing Arts, the National Art Centre, and Vancouver’s Chan Centre. For more information, please visit www.danielbolshoy.com or contact the Department of Music at 812-488-2754. The University of Evansville’s University Choir and Wind Ensemble are among a select group of collegiate ensembles invited to perform at the Indiana Music Educators’ Association annual convention in Fort Wayne, Indiana. As part of the IMEA convention, a professional development conference for Indiana music teachers, the Wind Ensemble will present a free, public concert at 10:30 a.m. Friday, January 18 at Fort Wayne’s Grand Wayne Convention Center, Hall C. The University Choir will perform at 2:30 p.m. Friday, January 18 at Fort Wayne’s First Presbyterian Church, and for the high school Indiana All-State Honor Choir that evening. The performances at the IMEA state convention are part of the University Choir’s and Wind Ensemble’s joint Winter Tour, which includes private performances at Evansville’s North High School, Olney Central College in Olney, Illinois, and East Noble High School in Kendallville, Indiana. One of four choirs at the University of Evansville, the University Choir has built a reputation for performances of major choral-orchestral masterworks, a cappella music ranging from the Renaissance through the 21st century, part songs, and spirituals. In May 2011, the University Choir joined five other choirs from Indiana, Kentucky, New York, and California to perform Haydn’s Paukenmesse at Carnegie Hall in New York City with the New England Symphonic Ensemble. This milestone performance for the choir was conducted by University of Evansville’s director of choral activities, Dennis Malfatti. At the IMEA convention, the University Choir’s program will include works by UE faculty member William Hemminger and alumnus Ronald Kauffmann. The choir’s performance at the 2013 IMEA convention is their second IMEA appearance in recent years, having also been invited to perform at the convention in 2010. That same year, the choir had the privilege to perform in a master class with the world-renowned vocal sextet, the King’s Singers. The University of Evansville Wind Ensemble is composed of UE’s finest brass, woodwind, and percussion performers. The ensemble performs a wide variety of literature from major masterworks for the modern wind band to more intimate chamber literature. The ensemble is also actively involved in commissioning and performing new works. In addition to its campus concerts, the group represents the University both regionally and nationally. Membership is by audition and is open to UE students of any major. The Department of Music at the University of Evansville will host its 33rd annual Holiday Pops concert next week. This festive celebration of the holiday season will begin at 7:30 p.m. Tuesday, December 4 at the Victory Theatre in downtown Evansville. The concert is free and open to the public. Holiday Pops brings together ensembles and soloists to perform holiday favorites. The evening includes performances by the University’s choirs, orchestra, and wind and jazz ensembles. This year’s program features around 190 University of Evansville students and five faculty members performing sacred and secular musical selections, including “I’ll Be Home for Christmas,” “Sleigh Ride,” Ralph Vaughan Williams’ “Fantasia on Greensleeves,” and music from Tchaikovsky’s “The Nutcracker Suite.” The concert will conclude with an audience sing-along of favorite Christmas carols. November's First Tuesday Concert to Feature "Frankenstein!!" In a nod to Halloween, the University of Evansville Department of Music will perform Heinz Karl Gruber’s Frankenstein!! for next month’s installment of the First Tuesday Concert Series. The performance will begin at 7:30 p.m. Tuesday, November 6 in Wheeler Concert Hall. Like all events in the First Tuesday Concert Series, it is free and open to the public. The performing ensemble for Frankenstein!! is comprised of UE music faculty and the resident string quartet, the Eykamp String Quartet. The work, a series of children’s rhymes by H.C. Artmann, is performed by a narrator and orchestra and was originally composed in 1971 for an arts ensemble in Vienna. In 1978, Gruber reworked the composition for both full orchestra and chamber ensemble. ? Violinist Joel Fuller, a member of the Washington, D.C.-based National Symphony Orchestra, will perform a guest recital at 7:30 p.m. Wednesday, October 24 in the University of Evansville’s Wheeler Concert Hall. The concert is free and open to the public, and the program includes works by Debussy, Faure, Bach, and Ysaye. Pianist Jiyoung Oh will accompany Fuller. Prior to joining the National Symphony Orchestra, Fuller served as the assistant principal second violin of the Kennedy Center Opera House Orchestra. He also spent three years as the assistant concertmaster of the Naples Philharmonic, enjoying many opportunities to solo with the orchestra there. As a chamber musician, Fuller was the first violinist of the University of Michigan Graduate String Quartet and founding member of the Sonare and Vanderbilt String Quartets. He is currently a member of the IBIS Chamber Music Society and Musica Aperta ensembles in Washington, D.C.
As a student, Fuller was awarded a three-year orchestral fellowship to attend the Aspen Music Festival in Aspen, Colorado. He was one of only two to receive the honor for the 2001 summer season. He received his Bachelor of Music from the University of Wisconsin and a Master of Music degree in violin performance and chamber music from the University of Michigan. Fuller has won numerous awards and competitions including the ASTA competition and both the University of Wisconsin Concerto Competition and the University of Michigan Concerto Competition. He is honored to play on the “ex Powell” Omobono Stradivari violin, generously loaned to him by the John C. Schroeder trust for musical excellence. Pianist Jiyoung Oh is a member of the faculty at the Levine School of Music in Washington, D.C. Oh received her Doctorate in Musical Arts from Indiana University Jacobs School of Music as a Chancellor’s Fellow and her Master of Music degree at the Eastman School of Music. She has performed as a soloist and chamber musician in the U.S. and Canada, and participated in summer festivals including the Aspen School of Music and the International Holland Music Sessions in Bergen. This past year, she was an interim piano faculty member at James Madison University where she taught piano and doctoral piano seminars. Prior to that, she taught at Lewis and Clark College and Indiana University. She was also a former adjudicator at the Virginia Music Teacher's Association State Competition. Oh is also a freelance pianist in the greater D.C. area. Next weekend, four University of Evansville alumni — all classical guitarists and former students of UE assistant professor of music Renato Butturi — will travel from as far away as Las Vegas to perform a reunion concert at UE. The concert will begin at 7:30 p.m. Saturday, October 13 in Wheeler Concert Hall. Admission is $15 for the general public, $5 for students, and free for UE students. The concert, co-sponsored by the Classical Guitar Society of Evansville and the University of Evansville, will feature Duane Corn ’90, Steve Dumbacher ’92, Tim Robinson ’91, and Troy Wright ’85 performing works by composers such as J.S. Bach, Gilbert Biberian, Jeffrey Van, and Luigi Boccherini. Corn graduated from UE with a Bachelor of Music degree in performance as well as a Bachelor of Music Education degree. Upon completion of his studies at UE, Corn earned a master’s degree at the University of Cincinnati College-Conservatory of Music. Corn, now living in Lexington, Kentucky, is an active performer and teacher who has completed the Suzuki Guitar School teacher training for books 1, 2, and 3. Dumbacher began his study of classical guitar at the University of Cincinnati CCM. After graduating from the University of Evansville, he went on to receive a master’s degree in performance from the University of Minnesota. Dumbacher now resides in Chicago and has performed throughout the United States. He works in the entertainment industry producing concerts and corporate shows globally. Robinson grew up in a family of music educators and performers in Asheville, North Carolina, and Lexington, Kentucky. In 1991, he received UE’s prestigious Gumberts Award, presented each year to the most outstanding senior music major. Robinson went on to study in the Master of Music program at the University of Cincinnati CCM. He currently lives in Las Vegas and works in performing arts management. Wright is a 1985 graduate of the University of Evansville, where he studied trumpet with James Bursen and guitar with Renato Butturi. He also received a master’s degree in classical guitar performance at the University of Cincinnati CCM. Wright is the guitar instructor at the Musical Arts Center in Cincinnati, where he has been teaching since 1995. On Tuesday, October 2, the University of Evansville Department of Music will present a concert in honor of the City of Evansville’s Bicentennial, featuring the world premiere of a new work composed for the occasion. The concert, part of the First Tuesday Concert Series, will take place at 7:30 p.m. in Neu Chapel and is free and open to the public. In recognition of the University’s contributions to the city’s cultural life, the program will feature works composed specifically for UE’s Department of Music. The University Choir, Jazz Ensemble, and Wind Ensemble will perform works by Ronald Kauffmann, Josh Stallings, and John Corigliano, and the concert will also include the world premiere of a new work by University Symphony Orchestra director Brian St. John. The concert will open with Jubilate Deo by Ronald Kauffmann, commissioned by the Friends of UE Music to honor Shirley Shepherd. Shepherd, an alumnus of Evansville College, taught vocal music in the Evansville Vanderburgh School Corporation for 41 years. Kauffmann, a former student of Shepherd’s, graduated from UE in 1971. He majored in voice and minored in both trombone and piano. The Jazz Ensemble, under the direction of Timothy Zifer, will perform Bells of November. The composer, UE student Josh Stallings, is a theatre design and technology major with associated studies in music, and is completing a Jazz Studies Certificate. Bells of November was composed in 2010 and was inspired by the Olmsted Hall chimes. The work was presented at the 2011 Elmhurst Jazz Festival where it received an honorable mention award. The highlight of the concert will be the University Symphony Orchestra’s world premiere of Brian St. John’s Dominion Overture. Written specifically for this event, the piece describes aspects of the settlement of Evansville, musically depicting clearing of land, construction of residences, and an emerging community arising next to the Ohio River. St. John has composed numerous works including a piano concerto, a bass concertino, a double concerto for mandolin, mandola, and string orchestra, and seven ballets. The program will conclude with the Wind Ensemble’s performance of John Corigliano’s Gazebo Dances, directed by Kenneth Steinsultz. Corigliano has emerged in recent decades as one of America’s prominent composers. Among his best-known works are his opera Ghosts of Versailles and his Oscar-winning score to the movie The Red Violin. He has received numerous prestigious awards including a Pulitzer Prize, the Grawemeyer Award, and three Grammys. Gazebo Dances was premiered in 1973 by the University of Evansville Wind Ensemble under the direction of Robert Bailey. First Tuesday Concerts, presented the first Tuesday of each month, showcase the talent of the University of Evansville music faculty (and occasionally students) as they perform works from seldom-heard masterpieces to beloved standards. For more information, please contact the University of Evansville Department of Music at 812-488-2754 or visit the department’s concert calendar. In celebration of her 40th year with the University of Evansville Department of Music, violinist Carol Dallinger will hold a faculty recital featuring two of her former students, now professional performers and music educators. The recital, which is free and open to the public, will begin at 7:30 p.m. Tuesday, September 25 in UE’s Wheeler Concert Hall. The program will feature violin and viola solos, duets, and trios by composers including Dvorak, Mozart, Schumann, and Shostakovich. Dallinger will perform with two of her former students in the Suzuki Violin Program, Scott Conklin and John T. Posadas. Conklin, a Murray, Kentucky native, is associate professor of violin at the University of Iowa School of Music. Posadas, a native of Henderson, Kentucky, currently serves as adjunct professor of viola and chamber music at the University of South Florida’s School of Music. Dallinger is currently the Oramay Cluthe Eades Distinguished Professor of Music at the University of Evansville. She is also founder and coordinator of UE’s Suzuki Violin Program, which currently serves more than 100 students ages 4-17 from around the Tri-State. An active performer, Dallinger serves as principal second violinist of the Evansville Philharmonic Orchestra and performs regularly at department recitals. She has lectured at state and national music conferences and, as a registered teacher trainer with the Suzuki Association of the Americas, frequently serves as a clinician for summer institutes throughout the United States. She has also taught in New Zealand and Australia, and is a former member of the national board of directors of the Suzuki Association. Dallinger’s honors include UE’s Outstanding Teacher of the Year award in 1995, the Arts Council of Southwestern Indiana’s Artist of the Year award in 1997, the Dean’s Teaching Award for UE’s College of Arts and Sciences in 2000, and the Suzuki Chair Award at the American Suzuki Institute in 2006. Most recently, she received the Friends of UE Music Distinguished Service Award for 2012. Dallinger holds a Bachelor of Music in performance from Illinois Wesleyan University and a Master of Music in performance from the University of Illinois at Urbana-Champaign. She currently teaches courses in applied violin, applied viola, music theory, and Suzuki violin pedagogy. For more information on upcoming events in UE’s Department of Music, please visit the online concert calendar or call 812-488-2754. The Department of Music at the University of Evansville is proud to announce its 2012-13 performances in the First Tuesday Concert Series. The First Tuesday Concert Series, in its fifth season, showcases the talent of the University’s music faculty as they perform works from seldom-heard masterpieces to beloved standards. All concerts take place the first Tuesday of each month at 7:30 p.m., and are free and open to the public. All events are held on the University of Evansville campus except for December 4’s Holiday Pops concert at the Victory Theatre. The 2012-13 series kicks off September 4 with the annual Fall Faculty Gala in Wheeler Concert Hall. This concert, celebrating the 50th anniversary of Wheeler Concert Hall, features a variety of works performed by the department’s faculty. October 2: Bicentennial Concert, Neu Chapel. Celebrate the City of Evansville’s 200th birthday through music. This concert features music composed and arranged for the River City, including Gazebo Dances, a student work for Jazz Ensemble, and a new piece written just for this occasion. November 6: Frankenstein! !, Wheeler Concert Hall. Inspired by H.C. Artmann’s poems Frankenstein!! (Noises, noises, all around – lovely new children’s rhymes), Heinz Karl Gruber’s composition for voice and chamber ensemble is full of surprises, fun, and covert political statements. Experience the classic monster in a revealing musical portrait. December 4: Holiday Pops, Victory Theatre (600 Main St., Downtown Evansville). Share a celebration of the holidays with the University of Evansville’s annual concert at the Victory Theatre. Hear performances of your favorite seasonal favorites by the department’s ensembles and faculty. February 5: Start Spreading the News, Wheeler Concert Hall. Faculty perform selections of solo and chamber music inspired by New York City. From Lincoln Center to Times Square, hear pieces written in, around, or about the Big Apple. April 2: Wind Ensemble, Neu Chapel. Following their performance at the Indiana Music Educators Association conference, the Wind Ensemble presents an evening of dance inspired works for wind band. The concert includes pieces by Ron Nelson, John Barnes Chance, Alfred Reed, and Donald Grantham. For a complete listing of concerts offered by the Department of Music, please visit their website or call 812-488-2754. This morning, several members of the University of Evansville family received recognition for their significant contributions to the arts in a seven-county region of Indiana. Winners of the Arts Council of Southwestern Indiana’s annual Arts Awards were announced at a news conference at the council’s Bower-Suhrheinrich Foundation Gallery. The recipients will be honored at an awards banquet at Casino Aztar on September 6. William Baer, Artist of the Year (two recipients chosen). Nominator Margaret McMullan, UE professor of creative writing, has worked with Baer for 23 years and says she knows no other writer who is quite so fearless in crossing into new writing genres. Baer has written plays, screenplays, novels, essays, poems, and musicals — all while teaching in UE’s Department of Creative Writing, mentoring students outside of class, and running the University of Evansville Press. Elizabeth Robertson, Artist of the Year (two recipients chosen). Robertson, UE consortium instructor of music for oboe and English horn, has served as principal oboe of the Evansville Philharmonic Orchestra since 1995 and is also a member of the Harlaxton Woodwind Quintet. Nominators call her a performing artist of the highest caliber who shows superb technique and musical expressiveness with every passage she plays. Also a disciplined and focused teacher, Robertson lays out clear expectations for her students and works tirelessly to help them achieve their goals. Jo Frohbieter-Mueller ’56, Arts Advocate of the Year. As a lifelong resident of Vanderburgh County, most of Frohbieter-Mueller’s activities have revolved around the arts: She is an artist, collector of art, published writer, musician, and research biologist. She plays fife in the Civil War Band and can often be found at classes and recitals, art exhibits, and board meetings. Truly a Renaissance woman, Frohbieter-Mueller says that art makes her happy. Her nominators say that those around her are made happy, too, by her support and enthusiasm.